United Empire Loyalist Ebenezer Allan (1752-1813) settled in the area in 1794 on a 2,000-acre (810 ha) land grant. He built a grist mill around which a settlement grew, but his subsequent land transactions antagonized authorities and he was eventually imprisoned for counterfeiting money. He died shortly after his release from prison in 1813. In 1820 the post office opened as Delaware, taking its name from the township. The name Delaware comes from a First Nations Peoples tribe of that name, some of whom had been driven out of the United States and settled along the Thames R. By the 1830s the original village around Allan's mill had been destroyed by a number of fires. The new village of Delaware was laid out in 1832 near the ruins of the first settlement. 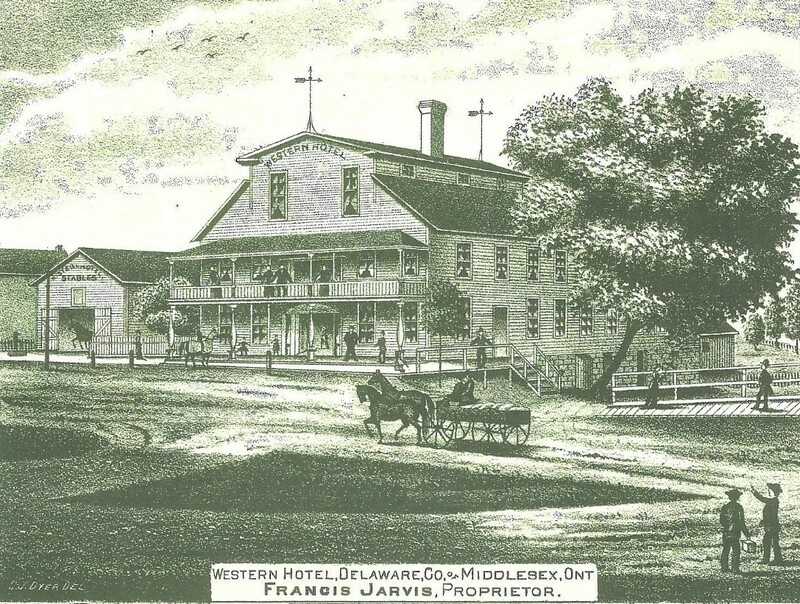 In 1842 Delaware was chosen as the township centre and a brick hall was built on the main road running through the settlement. By the 1940s the old town hall's location made it a traffic hazard. Vehicles often crashed into it when they failed to negotiate a sharp turn on Hwy 2. The building was demolished, and council held meetings for a time in the former Presbyterian Church. Prominent among past residents was Gideon Tiffany (1774-1854), one of the earliest printers in Upper Canada. He and his brother Silvester founded the province's first independent newspaper at Niagara in 1799. When it failed, he moved to Delaware T. where he became a major land owner and held public office. Have something to say about Delaware?